During discussions of favourite episodes of Star Trek: The Next Generation, often cited is the season 6 episode “Tapestry”. 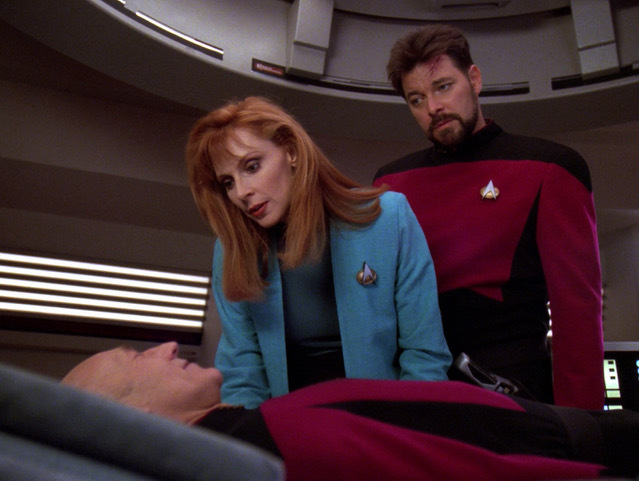 In the episode Jean-Luc Picard, our introspective and bookish captain, dies. A diplomatic mission goes awry and Picard is the victim of a random energy blast, which has an adverse effect on Picard’s artificial heart. As the teaser draws to a close, Jean-Luc is bathed in white light; walking towards an unknown figure. Picard reaches out to shake the hand of the divine, ever the explorer, when the figure is revealed to be intergalactic Robin Goodfellow himself, Q.
Q points out that if Picard hadn’t gotten in a bar fight in his youth, his organic heart would be intact. Imitating the divine, Q commands Picard to “make peace with your sordid past.” The voices of everyone who died under Picard’s command surround him. After a few moments of feigned strength, Picard admits to Q a few regrets in his life: His youthful ego, arrogance, and lack of discipline. 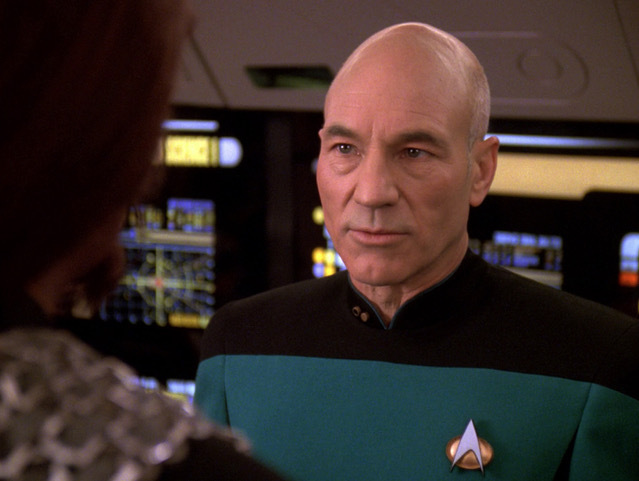 Q offers Picard the chance to change those qualities about himself. A chance to go back in time, and not get into the altercation that claimed his organic heart. A chance not to die. His choices will not unravel the universe (which is different than most other Star Trek time travel); All that is at stake is Picard’s peace of mind, and his life. Over the third act of the episode the audience is introduced to the life of one young ‘Johnny’ Picard. A life that includes his two best friends, Cory and Marta. Young Picard (still played by Stewart, Quantum Leap style) is slapped by one women as she discovered he made a date with another woman. This Picard is a Lothario and a cad. Through these scenes, which are coded as comedy, Q repeatedly tells Picard how impressed and inspired he is by Picard’s younger self. Dear readers, remember that if Q is impressed with your actions, especially towards someone you’re attracted to, you need to take a long, hard look in the mirror. And probably a very long, cold shower. The young Picard’s roguish, immature behaviour stands in stark contrast to who we know Picard to be. We meet the Nausicaans (and their Paul Stanley wigs that you now can’t be unseen) who cheat Cory and set in motion the revenge plot that leads to the fight. Picard, tries to reason with his cocksure friend, but Cory won’t listen to Picard’s “mature and level headed” council. Picard and Marta confide in each other. In what reads as one of the ickiest kisses in Star Trek, a 50-something Stewart (in the guise of his younger self) passionately kisses his 20-something best friend. After the galaxy’s most awkward farewell meal with three alienated friends, the historic bar fight ensues. 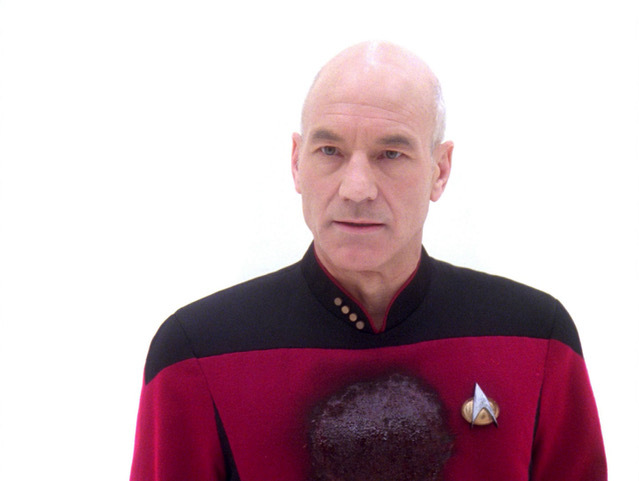 Picard prevents it from escalating and gets to keep his organic heart. I was made for stabbing you, baby! Back in the present day, we find a Picard who has lead a very different life on the Enterprise. He is no longer Captain, nor a member of the senior staff. Picard is now a Lieutenant, Junior Grade, the Starfleet equivalent of a pencil pusher tasked with delivering reports from one person to the other. Q explains that this Picard floated through life; never took risks. All this as a result of never facing death, the ruin which cost him his heart. Picard asks to return to the bar fight. He does and is stabbed through the heart. And as a result of making peace with his past, he no longer dies. Picard closes the episode with a speech about how removing one thread form the tapestry of one’s life can unravel the entire piece. He is at peace with the man he used to be. According to Insights, Picard always leads with cool book instead of fiery read. The Picard that we know as Captain of the Enterprise is not the man he was in his youth. Over his life, Picard has learned and grown. The man we know today isn’t a cad. As the closing of the episode implies, we create and ascribe meaning to the hardships and challenges experienced in life. There is comfort found in knowing the challenges of life are an essential element in the alchemy of self. Was young Johnny Picard really, truly suffering? What challenge did he face? The stabbing is tragic, however it is the consequence of his actions. What did the elder Picard admit to regretting in his life? Lacking discipline. Arrogance. Being ego-driven. Picard seeks to make (mostly) more mature choices, and is punished for them in this alternate future. The episode argues that to succeed, to have a fulfilling Starfleet career, Picard needed those qualities he now regrets. The episode, through Q, equates Picard’s (mostly) mature choices as playing it safe, which meant he never stood out. Reflecting on the toxic and boorish behaviour of young Picard, it is troubling. The episode draws this direct line from such behaviour of the past to success later in life. The phrase “boys will be boys” has been used to excuse all manner of patriarchal oppression, from the overt to the subtle. 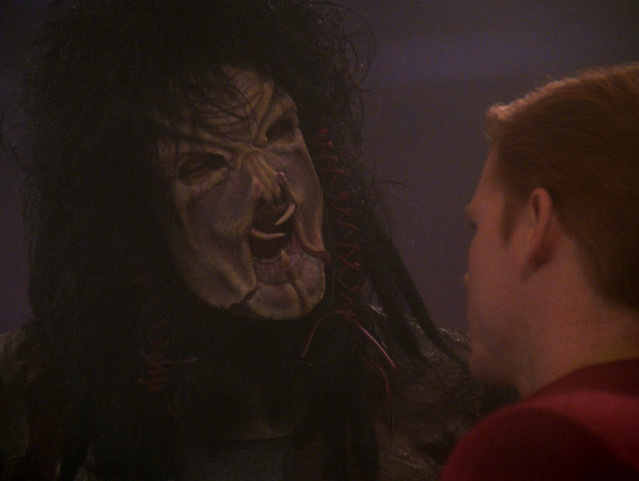 “Tapestry” argues that Picard’s life would be unfulfilling, a failure, had he not embraced his rougher behaviour. One would hope that the idealized 24th Century in which this episode occurs would not be beholden to the same patriarchal assumptions of past centuries, such as the idea that violence is an essential part of masculinity. Lieutenant JG Picard has the same ability, the same intellect, the same potential as Captain Picard. A utopian future would support and help Lieutenant Picard succeed and achieve what Captain Picard did. Yes, pulling apart loose threads of one’s life will unravel the sum of who a person is. However the specific loose threads explored in the episode should not be expected behaviour. They should not be accepted norms. They are not a requirement for success. The patriarchal structures and the culture of toxic masculinity and excuses shouldn’t be an essential element in anyone’s career success ever. Picard evolved. Many other men don’t. Individual change is needed. That change can and should not be limited to the internal. This change has to also be lived externally. Perhaps if Starfleet had lived their utopian values, had not perpetuated the same praise for boorish behaviour, Lieutenant Picard’s career would have looked very different.